Viewing will be Saturday from 4-8 PM and Sunday from 12-8 PM with family greeting friends from 3-5 PM at the funeral home. Darlene Joyce (Jackson) Porter was called to her Heavenly home on Feb 9, 2018. She was born Nov 5, 1937 in Oklahoma City, OK to W.C. & Ebbie Jackson. She graduated from Capitol Hill High School in 1956 & later married Wayne Porter. Together they enjoyed nearly 58 years raising a family. Darlene retired from ONG in 2000 after 21 1/2 years of service. She enjoyed sewing and was a member of the Quilt Guild, 0KSMA, ASG, SSSW, Red Hats and the ONGoers. She was a volunteer at Integris Southwest Medical Center for 10 years. 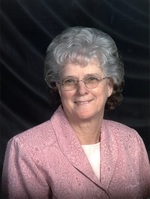 She was a faithful member of Bethesda Assembly of God for 37 years. Preceded in death by her parents; husband, Wayne Porter; son David Porter; five sisters & three brothers. She is survived by Daughters: Susan and husband Gary Emert; Darla and husband Billy Medaris; two sisters: Eunice Kidd &Patsy Walker; Daughter-in-law Donna Porter; seven grandchildren, who respectfully call her grandmother, Stephanie Jackson and husband Ryan; Brandon Porter and wife Adela; Chris Porter and wife Mallory; Tiffany Talley and husband Chris; Taylor, Jordan, and Hunter Medaris. Nine great-grandchildren: Makayla, Jacoby, Garren, & Brayden Jackson; Zackary & Madison Talley; Noelle, Everly, & Aurora Porter as well as many other family & friends. Special thanks to Encompass hospice for their loving care, and also to Dana Brown. To send flowers to the family of Darlene J. Porter (Jackson), please visit our Heartfelt Sympathies Store.